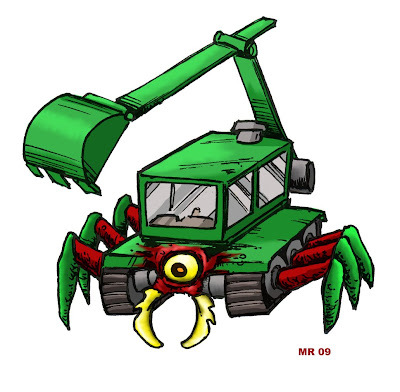 A Tsukumogami spawned from a heavy construction shovel. Along with his buddy Craneosaurus, he enjoys a hard days wok for a good day's pay. He also tends to uncontrollably whistle at women as they walk by. Golems are artificial beings and originate from Jewish folklore. They are usually overlarge "men" created from clay, and animated by placing holy words in the mouth on slips of paper or written on the creature itself. The Golem will be deactivated when the paper is removed or the words altered. 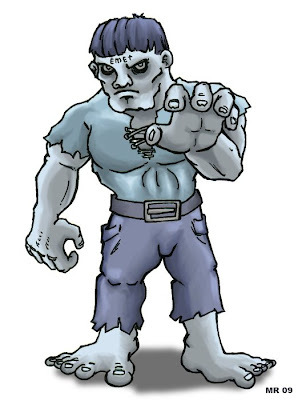 Golems generally serve as protectors of communities, but may also be created as personal servants or for specific missions. They have very low intelligence and a tendency to run wild. What originally began as an experiment in biomechanics by a gifted undergraduate has had disastrous ecological consequences. 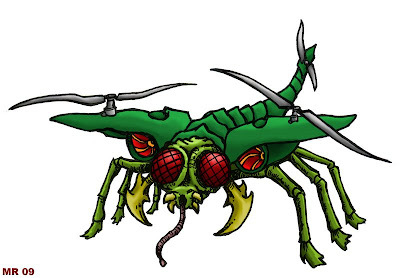 The locustcopter is a 10 inch long insect with twin biomecahnical rotary blades that allow it to achieve unnatural speeds. A few escaped the lab and bred in with local locust populations, and now swarms of the flying monstrosity spread from continent to continent, devouring everything in thier path. 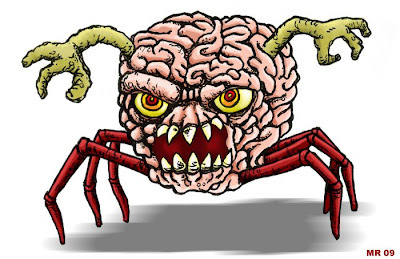 Giant brains from beyond the stars that have come to steal our bodies. Hopefully they'll land in a small midwestern town and be spotted by two teenage lovers, so they can try to warn all the grown ups but not be believed, and will end up saving the Earth by somehow exploiting the Brain Crab's one sole weakness that will probably be something so rediculous that it would preclude any chance of them ever evolving. That's usually how these things play out. 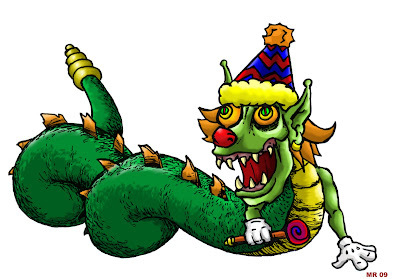 Goblins were originally household spirits in European Pagan belief. "Goblins" went by many different names - Hob, hobgoblin, brownie, nixie, tomte, etc. Generally, such "faire folk" were helpful around the house unelss offended, by which they would then perform pranks and mischief. Such a belief in household spirits may have evolved from ancient ancestor worship. 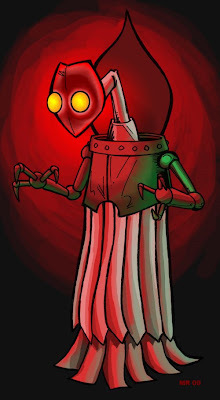 The Flatwoods monster is a strange anomalous creature that appeared near Flatwoods, Virgina on Sept. 12th, 1952. 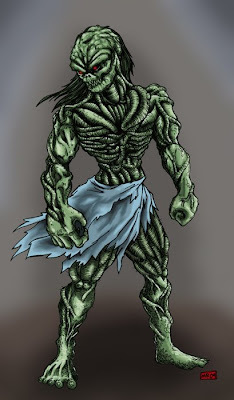 Eyewitnesses describe a 10 foot creature with a green body, large glowing eyes, small branch-like "arms," and a glowing head covered by (or in front of) a heart shaped cowl of some kind. Along with the creature came multiple UFO sightings. Several eyewitnesses also described some type of mist or gas emitted by the creature, and were sick for several days afterward. What was it? The conventional explanation is that the monster was an Owl - although how someone could have mistaken a common barn owl with a ten foot tall glowing alien monster is beyond me. Frightening monstrosities from beyond the stars, despite it's freakish appearance the Ohopod is quite intelligent. Millions of years before the rise of mankind colonies of the outer space invertebrate colonized the Earth, however all but a few were wiped out during an asteroid impact. 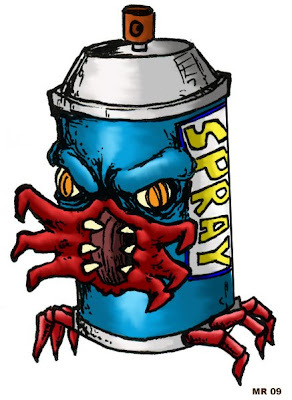 A Tsukumogami evolved from an aerosol can. Although most consider his work low class or unsightly, he is actually a true artist at heart, on the cutting edge of urban culture. He required a photo ID when purchased. Try to vandalize anything with him and he'll eat your hand. I don't think any explanations are needed for this one. Asmodeus is an arch demon, depicted in the Book of Tobit as a demon twists men's desires. Early representations cast him in an almost playful, satyr-like light. Later depictions center more around Lust as his main vice. He runs gambling houses in Hell, confuses virgins, inspires jealousy between newlyweds, etc. The Zombie originated in African / West Indian folklore, when a voodoo priest would seal someone's soul into a clay jar as a way of enslaving them. It turned out this practice of zombie slavery had roots in reality - in Haiti the act of zombification involved inducing a death-like coma with a rare drug. The victim would be believed dead and thus be buried, when later on the perpetrators would dig the affected person up and force them into labor. 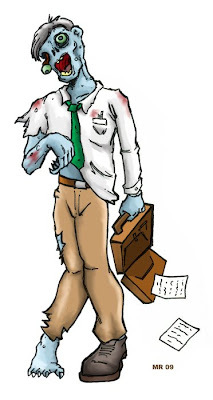 Victims of the zombie racket would find themselves shunned by their superstitious family and friends, with no where to go except to submit to the will of their captors. In modern fiction, zombies have become the mindless animated corpse of a person, brought back from the dead in an animalistic state, who's only purpose is to wander around slowly and consume the flesh of the living, especially the braaaaaiiiiinnnsss..... They are usually brought back in masse, have limited intelligence or memory of thier former lives, and can be dispatched with a shot to the head. 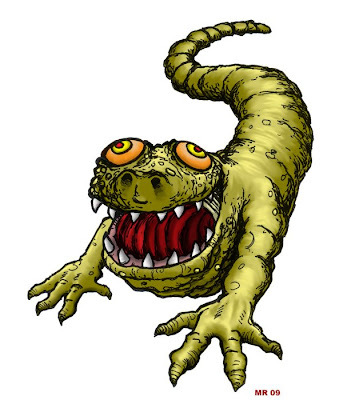 Bizarre mutants spawned from ground zero, the Sand Eater is a freakish mutation birthed at Nevada nuclear test sites. They grow to 10 - 15 feet long and are capable of moving through solid Earth at incredible speeds. The hideous creature known as the Marles Man began life as a corporate marketing ploy. In an attempt to erase bad P.R. 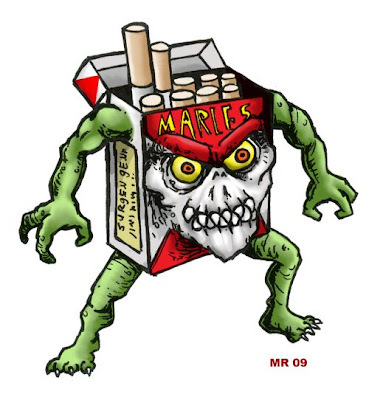 the Marles tobacco company commissioned a series of children's television programming starting a hero based on Marles brand cigarettes. A freak accident involving lightning bolt and chemistry set somehow brought the rubber Marles suit to life, and mutated it into it's current freakish, skull-faced visage. The Marles Man now spreads fear, hiding in children's closests and under beds, a living reminder that inhaling smoke in no way is healthy for you. 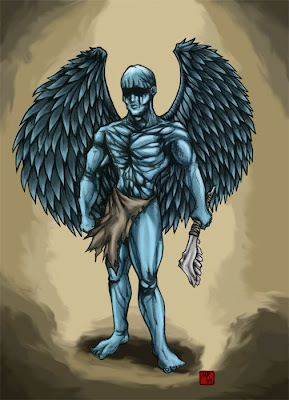 Samael is the name of the Angel of Death in traditional Jewish lore. Unlike most characters from Abrahamic religions he seems to possess both good and evil qualities. Depending on the source he is equated with Satan (tempts Eve as the serpent,) at other times clearly aligned with God (wrestles with Jacob,) other sources such as the Kabballah list him among the Fallen angels. In this depiction he's armed with an axe made from a jawbone of a mule, and has torn his eyes out to spare himself the grief that his task entails. 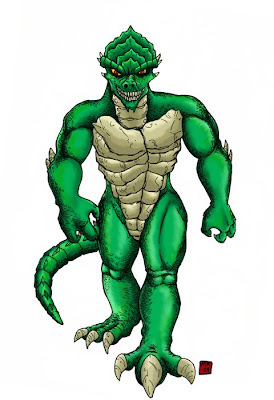 Rumors of Reptilian humanoids began emerging upon the UFO abduction scene in the early 1990s. 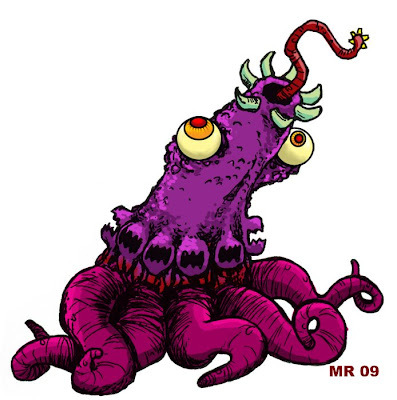 They are described as between seven to nine feet tall, with a huge muscular frame, clawed hands and feet, glowing red eyes, and sometimes even wings. They are generally seen as working behind the scenes, in command of a smaller species of Alien Grays (although details are fuzzy on this point.) Researchers such as David Ike claim that the highest levels of the world's governments have been infiltrated by shape-shifting reptilians, and that many of our world leaders are in fact reptiles in disguise. Stories of the Yeti (from Meh-Teh, "Man-Bear") go back centuries into the folklore of the Sherpa people of Tibet and Neapl. It is described as between 7-13 feet tall, covered with shaggy hair (usually of a dark color,) with a bipedal gait, and an odd, pointed head. 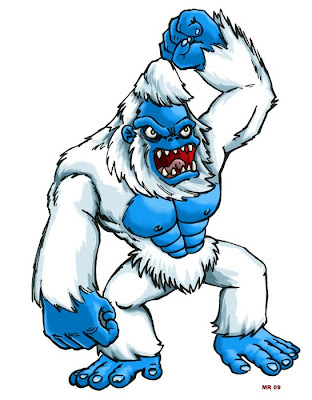 The "Abominable Snowman" became famous in the west after western explorers discovered it's tracks while attempting to scale the Himalayas. Although many expiditions have been undertaken to caputre the creature, conclusive evidence of it's existence has remained elusive. 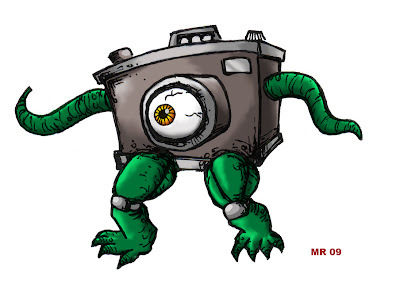 A disturbing cyborg monstrosity, created by dark science and alchemy to subjugate mankind. He just happens to like big hats. More Sentai inspired creatures. Maybe one day I'll do something with them. Ghouls are born from Arabian mythology, and originally were shapeshifting demons who raided cemeteries and burial grounds to feast upon corpses. In modern fiction they've become a sort of stronger, super-zombie, usually with some modicum of superhuman strength and free will. 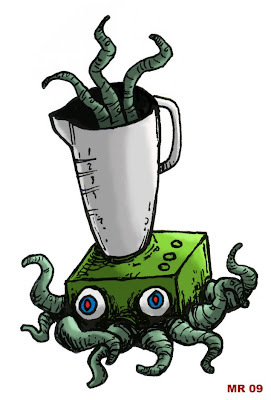 A Tsukumogami formed from a fast food drink container. 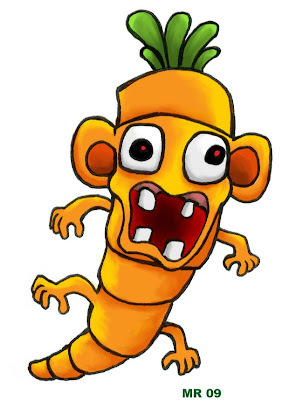 Clopticus hunts down those who abuse the free refill privilege. He goes well with the Burger Lord. 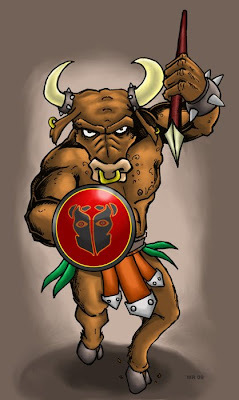 The Minotaur is the hideous offspring between the wife of King Minos and the Cretan Bull, a revenge orchestrated by the god Poseidon. 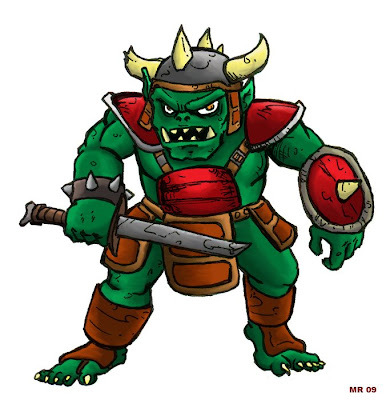 The man-bull grew ferocious and was isolated in a vast labyrinth beneath the palace. Every nine years seven young men and seven unwed maidens were forced into the labyrinth to be hunted down by the Minotaur as sacrifice. The beast was eventually destroyed by the Greek hero Theseus with the help of the Princess Ariadne. 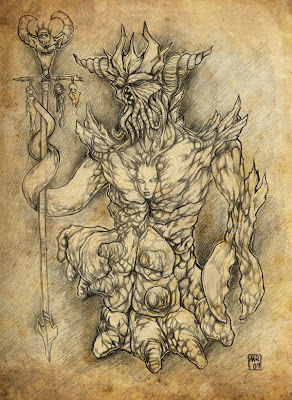 Dorinkuman was a minor demon henchman, with the command of his own small legion. An aeon of repeated defeats in Hell's never ending civil wars have finally taken it's toll on him. After a quick trouncing by the Demon lord Asmodeous he decided to leave hell and recruit souls from the human world. 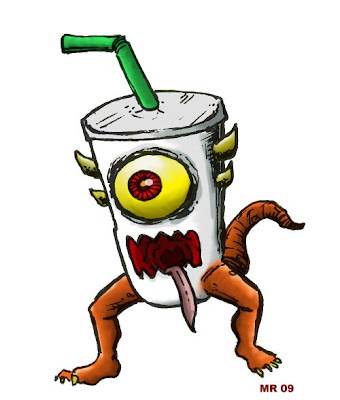 Howerver a mishap in trans-dimensional travel stranded him within an ordinary soda machine. 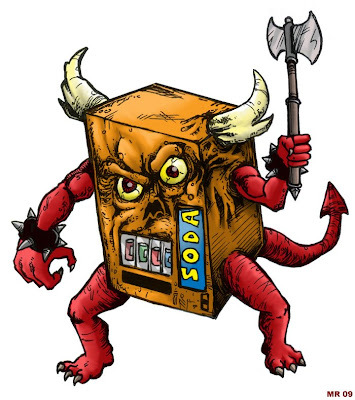 Dorinkuman now spends his time tempting and perverting humans into his growing hellish army with free soda. It does not seem to be working too well. Serpenzo the serpent boy was born with an extremely rare condition, so incredibly rare that science had not yet cataloged it. His entire body below the shoulders took the form of a long, snake-like structure, with mid-ridge spines and a "rattler" at the end. His unique birth defect eventually became known as "Lamia syndrome." Shunned from normal human society, Serpenzo eventually made a name for himself traveling the world and exibiting himself in a circus side show. Upon the death of his fourth wife under dubious circumstances Serpenzo disappeared, and has become somewhat of an urban legend. 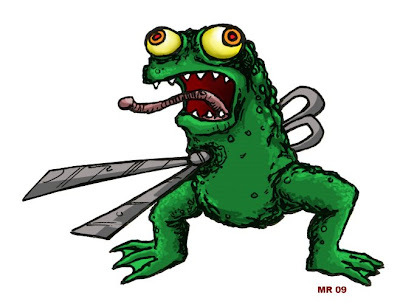 The result of a high school science experiment gone wrong, where a deranged honor student somehow grafted a pair of surgical shears onto a mutated West African Goliath Frog. Thankfully, all he seems interested in is swimming around and croaking all day. But he's still freaky. 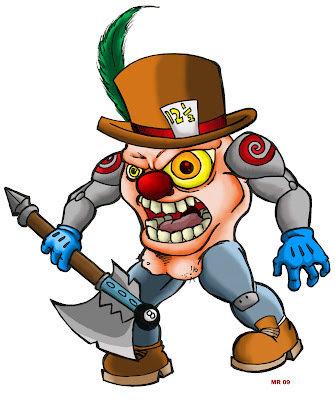 Another Tsukumogami evolved from a common kitchen blender. I would not use one that had tentacles coming out of it. Belief of ghosts or specters are worldwide in all cultures. Generally this type of ghost will result from the death of a person "before their time" in a tragic manner, be it through an accident or intentional violence. A specter tends to take recognizable human shape (as opposed to a mass or "orb,") and will be tied to a particular location, most commonly a home or area where the person met their fate. These types of ghost are also usually indifferent to human co-inhabitants, and will usually not even notice a living person unless confronted. I myself have never seen one. Sasquatch is a large primate that dwells in the American Pacific northwest, where large amounts of undisturbed forest still remain. Reports of such a beast go back to Indian folktales and persist all through America's history. 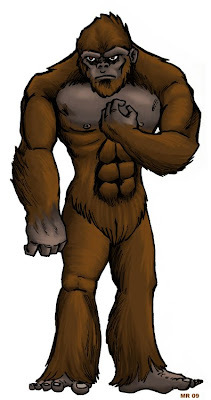 Sasquatch (otherwise known as Bigfoot,) is typically described as extremely tall (7 - 13 feet,) covered in shaggy hair of a brown-reddish color, walking upright, and combining many features between humans and apes. The nickname "Bigfoot" comes from the creature's unusually large foot size (up to 20 inches,) as footprints are usually the only remaining evidence after a sighting. 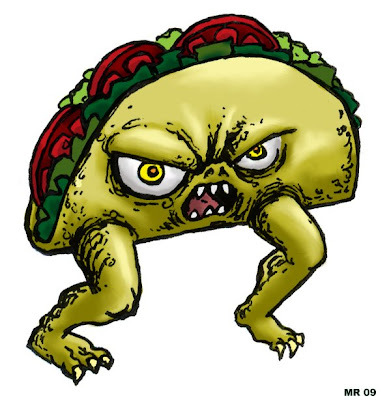 Although there have been sporadic reports of people who have been attacked or even abducted by the creature, generally they tend to shy away from humans, and will leave the area quickly upon being sighted. This would still not stop me from running if I were to encounter one. Cousin to the Flying Spaghetti Monster, his rival church is seen as heretical by many Pastafarians. 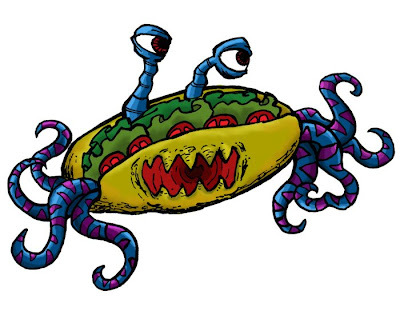 Truth be told, the Flying Subway Sandwich Monster is highly jealous of his noodley sibling, and seeks to lead his flock astray. Bapple won't stop 'till you're dead. 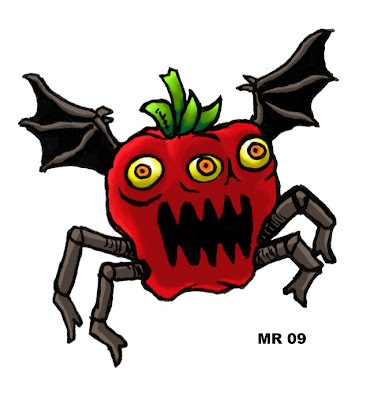 Run from the Bapple. Escape while you still can. The spirit of a medieval knight brought back into a cyborg body for the subjugation of mankind. The iron balls can be shot out and retracted through long chains. More Sentai inspired monsters... the more the merrier. he retreats to the trees.